WASHINGTON, DC, January 23, 2014 (ENS) – Five NASA Earth science missions will fly into space this year, with two of them headed for the International Space Station. NASA says the new missions will open more technically advanced remote eyes to monitor the changing planet. Two of the 2014 Earth science missions will be sent to the International Space Station to measure ocean winds, clouds, and aerosols, marking NASA’s first use of the orbiting laboratory as a 24/7 Earth-observing platform. The new instruments are the first of a series that will observe Earth routinely from the Space Station. The first new NASA Earth science mission of 2014 is the Global Precipitation Measurement Core Observatory, a joint international project with the Japan Aerospace Exploration Agency, JAXA. The GPM Core Observatory is scheduled to launch on February 27 from JAXA’s Tanegashima Space Center on a Japanese H-IIA rocket. The spacecraft was built at NASA’s Goddard Space Flight Center, Greenbelt, Maryland. This mission inaugurates an unprecedented international satellite constellation that will produce the first nearly global observations of rainfall and snowfall. NASA says this new information will help answer questions about Earth’s life-sustaining water cycle, and improve water resource management and weather forecasting. In July, NASA will launch a mission to advance understanding of carbon dioxide’s role in climate change. The Orbiting Carbon Observatory (OCO)-2, a replacement for a mission lost after a 2009 launch vehicle failure, will make precise, global measurements of carbon dioxide, the greenhouse gas that is the largest human-generated contributor to global warming. OCO-2 observations will be used to improve understanding of the natural and human-induced sources of carbon dioxide and how these emissions cycle through Earth’s oceans, land and atmosphere. OCO-2, managed by NASA’s Jet Propulsion Laboratory in Pasadena, California, will launch from California’s Vandenberg Air Force Base on a Delta II rocket. With the November launch of NASA’s Soil Moisture Active Passive mission, scientists will track Earth’s water into one of its last hiding places – the soil. SMAP will map Earth’s soil moisture, and provide precise indications of the soil’s freeze-thaw state to improve understanding of the cycling of water, energy, and carbon. High-resolution global maps of soil moisture produced from SMAP data will inform water resource management decisions on water availability around the Earth. SMAP data also will aid in predictions of plant growth and agricultural productivity, weather and climate forecasts, and will help monitor floods and droughts. SMAP will launch from Vandenberg Air Force Base onboard a Delta II rocket. The Jet Propulsion Laboratory manages the mission. “On our home planet Earth, water is an essential requirement for life and for most human activities. We must understand the details of how water moves within and between the atmosphere, the oceans, and the land if we are to predict changes to our climate and the availability of water resources,” said Michael Freilich, director of NASA’s Earth Science Division in Washington. “Coupled with data from other ongoing NASA missions that measure sea-surface salinity and that detect changes in underground aquifer levels, with GPM and SMAP we will have unprecedented measurements of our planet’s vital water cycle,” Freilich said. The International Space Station has served as a unique platform advancing scientific research and technological discovery for more than 13 years. Its mid-inclination orbit allows for observations at all local times over nearly 85 percent of Earth’s surface. 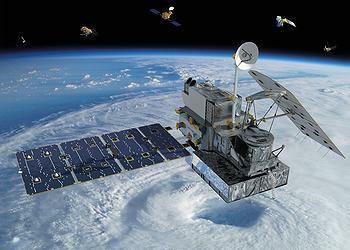 NASA plans to launch five Earth-observing instruments to the ISS through 2017. These missions are developed and operated jointly by the International Space Station Program and the Earth Science Division. The first of two Earth science missions going up to the Space Station this year, ISS-RapidScat will extend the data record of ocean winds around the globe, a key factor in climate research, weather and marine forecasting, and tracking of storms and hurricanes. ISS-Rapidscat is scheduled to launch June 6. Using inherited, repurposed hardware, NASA says that ISS-RapidScat will provide high-value science at a fraction of the typical cost of developing a free-flying satellite. ISS-Rapidscat will fly to the station aboard a SpaceX Falcon 9 rocket and Dragon cargo spacecraft from Cape Canaveral Air Force Station, Florida, on a commercial resupply flight for the Space Station. The second ISS mission headed for the Space Station this year is the new Cloud-Aerosol Transport System (CATS), scheduled to launch September 12 on another SpaceX ISS commercial resupply flight from Cape Canaveral Air Force Station. 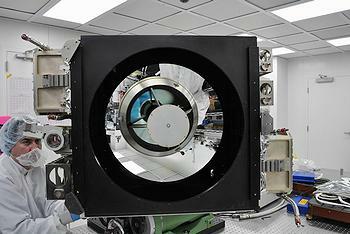 CATS is a technology demonstration mission using three-wavelength lasers to extend satellite observations of small particles in the atmosphere from volcanoes, air pollution, dust, and smoke. “These aerosol particles pose human health risks at ground level and influence global climate through their impact on cloud cover and solar radiation in Earth’s atmosphere,” NASA says. “With these two instruments launching to the space station, ISS will come into its own as an important platform for studying the Earth system and global change,” said Julie Robinson, space station chief scientist at NASA’s Johnson Space Center in Houston. “This is just the beginning of the space station becoming a part of the global Earth-observing network,” she said. NASA also uses research aircraft equipped with sophisticated sensors to advance Earth science research. This year, NASA is sponsoring 12 flight campaigns that will study the polar ice sheets, urban air pollution, hurricanes, ecosystem health and more over the United States, Central and South America, Antarctica, and the Arctic Circle. Putting satellite data to work meeting local and regional needs around the world is another part of NASA’s Earth science mission. In 2014, projects sponsored by the NASA Applied Sciences Program will tackle ecosystem issues in the Gulf of Mexico, water scarcity in the U.S. Southwest, and flood management in the Mekong River Delta. This year, NASA’s Earth Science Technology Office will test new sensors to improve measurements of water levels in lakes and reservoirs, carbon dioxide, terrestrial ecosystems, and natural hazards such as earthquakes and tsunamis.